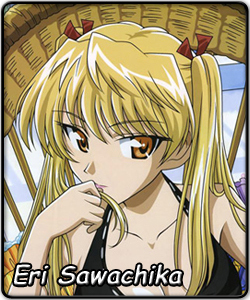 Since the beginning of School Rumble, Eri is described to have two natures. Her talents, beauty, riches, athleticism and popularity make her classmates believe that she lives the glorious lifestyle, though in reality, she uses this image to hide her feelings of loneliness and insecurity. Eri is the daughter of a prominent English businessman, and although she was born in Japan, she was raised in England, therefore having limited knowledge in Kanji. She had been proposed to numerous times but always turned them down, not being interested. People were bad-mouthing her from behind her back on this though, and she was truly lonely until she found herself helping classmate Mikoto with shopping and joining a gathering of rowdy but frank and good-natured family friends. In time, Eri had a core group of friends and life seemed to be going fine, until she got a crush on her high school's most infamous delinquent, Kenji Harima. It started after an accidental love confession, uttered with such emotion that it shook her. This turns into a love-hate relationship, where Eri has difficulty admitting her feelings and controlling jealousy. It causes a strain with her close friends. When a love rival appears, bitter pride starts to rear its head as we move along the timeline. Well, what can you say? She's rich, she's beautiful, she's talented... she's perfect for a Saimoe Queen, right? Close, but no cigar. In 2006, Eri Sawachika endured an amazing run, culminating into two top eight finishes. In Korea Best Moe, Eri endured a relatively impressive run, defeating Sakura (Tsubasa Chronicle) and Souseiseki (Rozen Maiden) along with others by comfortable margins to reach the semi-finals. However, her semi-final matchup was against Haruhi Suzumiya (Suzumiya Haruhi no Yuuutsu), the one slated most likely to win the tourney. In a heated battle, Eri edged Haruhi by only 11 votes, thus rewarding her with a trip to the finals. Her run in Korea ended in a loss to Suiseiseki (Rozen Maiden) by 130, and she finished in 2nd. In Saimoe Japan, her road to the Saimoe crown was much tougher, as Eri immediately was forced to face Tsuruya (Suzumiya Haruhi no Yuuutsu), who also finished in the top 16 in Korea, in the first round. After winning a close match by 147, Eri passed the 2nd round with ease, but was then pitted against Kyon's Sister (Suzumiya Haruhi no Yuuutsu). In the round of 32, Eri defeated Kyon's Sister and moved on to the round of 16, where she faced another up-and-coming opponent, Mion Sonozaki (Higuarshi no Naku Koro Ni). After winning by only 5 votes, Eri's luck went out, as she lost to Shana (Shakugan no Shana) in the round of 8 by 151 votes. Eri was also invited to participate in Korea's Super Best Moe. Her preliminary match consisted of three powerful potentials: herself, preliminary favorite Suigintou (Rozen Maiden), and virtual unknown Mai Kawasumi (Kanon). During the last hour of her match, a virus from the voting results system was injected. Although Suigintou was declared the winner, it seemed that Eri would have moved on because she was unofficially declared to be in 2nd Place. However, after further inspection, Eri's run in Korea's Super Best Moe was over - by only one extra vote to Mai. With the School Rumble series complete, Eri is ineligible to participate in the regular 2008 Saimoe Circuit, meaning that after the completion of the International Saimoe League, she will have to wait until November to compete in Korea's Super Best Moe. With the best competition ever assembled, Eri will have to use her own talents and beauty in order to win the love of her fans and the International Saimoe Crown.